Enjoy this phenomenal view, overlooking the wide Bimini Canal, looking towards the Wisteria Canal. Gulf access with just a few minutes to the river. The condo is on intersecting canals, very spacious and fully equipped. The newly remodeled kitchen opens to massive great room. Enjoy every morning at the beautiful breakfast bar. The master bedroom has a large Queen Sized bed with a luxurious comforter and comes with its own private bathroom, dressing area sink and mirror and walk-in closet. You will enjoy waking up to a gorgeous waterfront view. The second bedroom has two twin beds and its own bath. The twin beds can be converted to a king size bed. Both bedrooms are nicely and fully furnished with everything you might need. 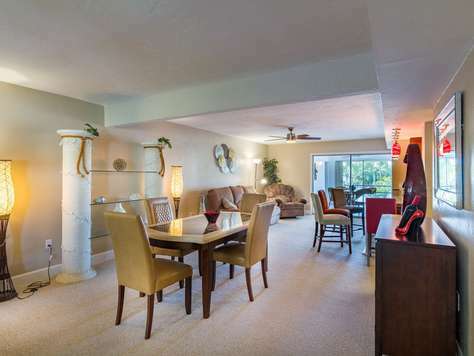 The huge great room with the open kitchen is inviting you to spend your evening in a comfortable sectional looking at television or to take pleasure sitting next to the lanai in the two-person massaging and heating reclining love seat enjoying the water view. Start your day with a morning-coffee overlooking the waterfront from the comfortably furnished lanai. 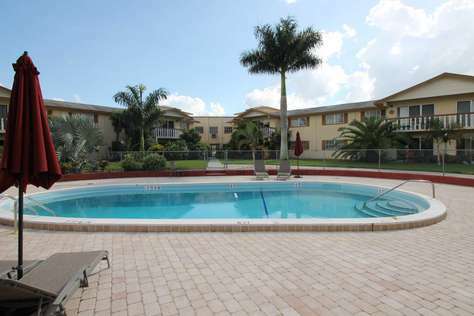 The condo is located just outside of downtown Cape Coral in walking distance to shops, parks & restaurants. 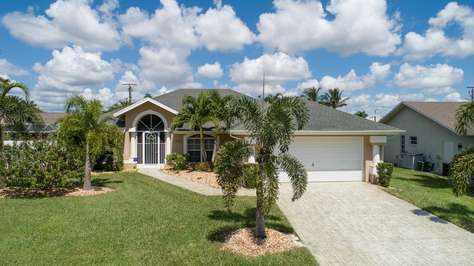 Enjoy the South East of Cape Coral, close to everything. Just 5 minutes to the Yacht Club Beach where you will find a large picnic area, a playground and the newly opened Boathouse Bar & Grill. The home owner association requires an approval which can take up to seven days. Please get in touch for further information. Sweet as candy is this beautiful 2,000 sqft home. Fully equipped with everything you can think of. Divided in 3 bedrooms (1 King, 1 Queen, 2 Single) plus TV-room (Sofa / Airbed) and two upgraded bathrooms, both equipped with a modern walk-in-shower. This property offers plenty of space for up to 8 sleeps. With an oversized outdoor area, outdoor kitchen, an electrically heated pool, boat dock with boat lift this is the perfect location to relax and enjoying the Florida outdoor living. Bring your own boat or get a rental delivered to the house. With a ride through the north spreader waterway you can reach the open water in 15-20min. Lovely decorated in and outside this spacious house is inviting in a modern style combined with a Caribbean charm. Our property is pet-friendly and is welcoming pets up to 25 lb. There is a separate pet fee of $149.00 per pet per stay in addition to the accommodation costs. 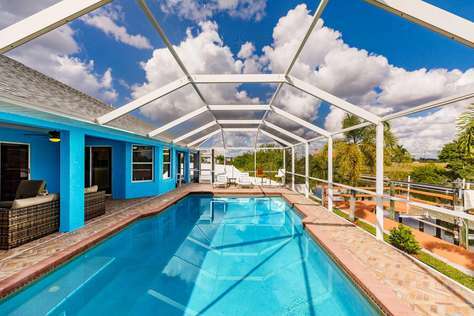 Villa Coral Escape was completely tastefully decorated and furnished in July 2018, this place has everything you need for your perfect Florida vacation. The house has 2 Master bedrooms with access to the pool, each one with its own full bathroom. One Master suite is equipped with a king size bed, the other Master suite offers a beautiful queen size bed. The 3rd bedroom has 2 single beds and the 4th bedroom has bunk beds – a lot of fun for your kids. In the center of the home you’ll find a fully equipped kitchen. Enjoy the spacious Southern Exposure pool area for your entertainment. Take a bath with your family and friends while your husband makes yummy dinner on the gas grill. The professionally landscaped home is in an excellent location in a quiet neighborhood, close to restaurants, shops, and much more. Enjoy lots of attractions like kayaking, dolphin tours, biking, fishing and explore the delicious local Caribbean style waterfront restaurants on Matlacha. Villa Flair is located at heart of the city of Cape Coral. And the property sits close to amenities ranging from grocery stores, restaurants all through entertainment and cinema as well as bowling facilities. All these amenities can be reached in a mere 5 minutes or so. The Edison Mall in Fort Myers is also located a tiny distance from the property and one can get there by just taking a short drive over the bridge. The beach and the airport are just 30 to 40 minutes away from Florida Flair while the nearby parks and boat ramps can be accessed in less than 8 minutes. This makes access to fun activities quite easy and transport to and from Villa Florida Flair hassle-free. The villa’s backyard is very inviting and it ignites the holiday vibe at any time. You can take a nap at the pool, enjoyed some grilled meat at the BBQ area or just soak yourself in the perfectly curved pool. The pool deck offers both a full-sun location and a shady place, which means you are free to lounge in the sun or kick back in the shade. 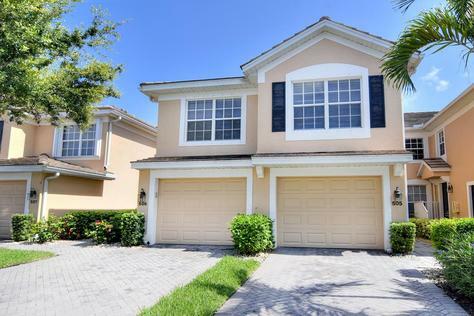 If you would want to enjoy a full day of sunshine, then Villa Florida Flairs south rear exposure would just do you good. 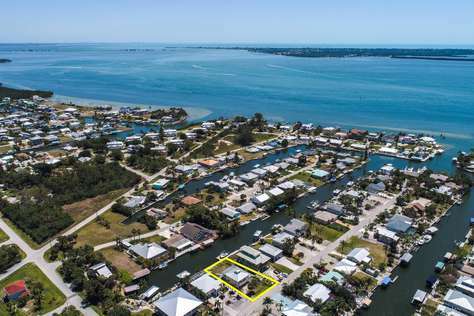 Villa Manatee - Spectacular waterfront views. Great Rates!!! The Manatee Villa is a beautiful 3-bedroom, 2-bathroom Villa located in the heart of the Southeast of Cape Coral. 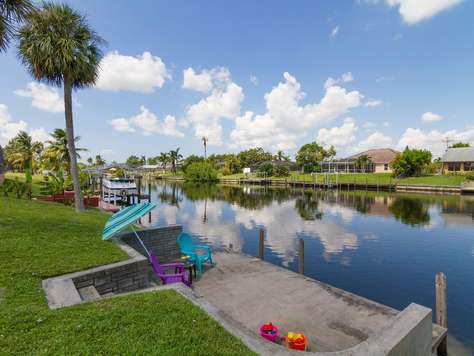 Enjoy the spectacular view over the wide Gulf Access canal and relax on the boat dock having your morning coffee. Sometimes you will see manatees or dolphins swim by. The canal leads into the Caloosahatchee river and finally into the Gulf of Mexico. Take pleasure of this magnificent tropical place. The Villa is completely new equipped in 2017. The master suite features a king size bed and queen beds in the guest bedrooms. The screened lanai invites to relax and overview the canal. Just off Del Prado Blvd. you are close to shopping and dining. Our Manatee Villa can accommodate up to six people, the three bedrooms are comfortable equipped. The luxury and beautiful Villa Spain is centrally located in the most sought area of Cape Coral. Close to shopping, entertainment and close to the countless beautiful beaches of Sanibel Island, Fort Myers and Bonita Springs. Many international and specialty restaurants in almost walking distance. Enjoy waterfront dining at Cape Harbour, Tarpon Point or in the Boathouse at the Cape Coral Yacht Club with his beautiful little beach. With almost 2,000 sqft, 3 bedrooms, office (with trundle bed), 2 bathrooms and a heated saltwater pool offers the house everything you need for your perfect stay. The fully equipped kitchen is inviting for those who like to cook or just to enjoy the breakfast together sitting at the large kitchen counter. With the huge sliding doors the living room and dining area feel like as a part of the terrace. 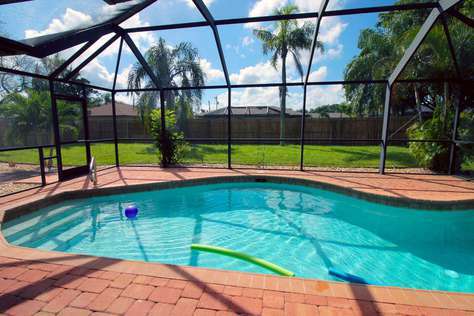 You can open up the sliding doors all the way to cherish Florida’s outdoor living. Experience Florida living at it's best in this beautifully furnished 1st floor lake front carriage home in Cape Coral's premier resort style gated community! 2 Bedrooms and den with 1 king bed 1 queen bed and sofa bed in den. Both bedrooms have walk-in closets. There is a large walk-in shower and dual sinks in the master bath and a tub/shower combo in the guest bath. The den can be used as a 3rd bedroom, office, study or TV room. A walk through galley kitchen with breakfast bar. There is a dining area off the living room and kitchen and a breakfast area at the end of the kitchen with gorgeous lake views. There is a single car garage and parking space for one extra car. Guest parking is just a few steps away for visitors. Laundry room is in the unit with washer and dryer for your convenience. Your community pool is only steps away, or head over to the resort-style lagoon pool complete with kids area and 100-foot water slide. Basketball, tennis, pickleball, bocce courts, sand beach volleyball, jogging paths, fitness center, community parks, fishing pier and so much more.